The Grand Canyon measures 277 river miles long, up to 18 miles wide, and one mile deep. As one of the seven natural wonders of the world, Grand Canyon reveals a beautiful sequence of rock layers that serve as windows into time. The Canyon includes rock nearly two billion years old in the bottom of the Canyon and the strata revealed preserve a lengthy, although incomplete, record of Earth’s history. FUN FACT: The bottom layer of Bryce Canyon is the rim of Zion, and the bottom layer of Zion is the rim of Grand Canyon. 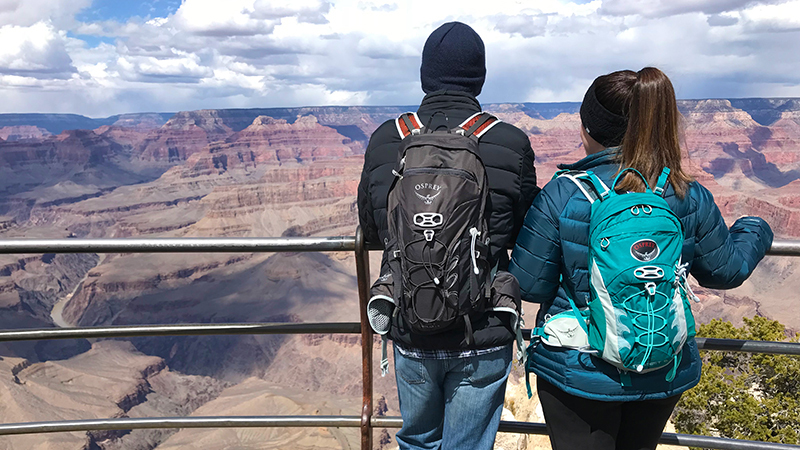 I have wanted to plan a trip to Grand Canyon National Park for years, but when we decided to visit the park during spring break this year, planning our Grand Canyon activities and seeking out things to do wasn’t as easy as I thought. We had two full days planned on the South Rim and I wanted to see all the best Grand Canyon sights and do all the fun things there is to do. But when I started doing the pre-vacation research, looking for things to do in Grand Canyon National Park, I was overwhelmed with expensive tourism companies hawking helicopter rides, jeep tours, bus tours, and more. We didn’t want to do any of those things. Plus, with approximately 5.5 million people visiting Grand Canyon every year, we knew it was going to be crowded. When we visit national parks, we like to hike, picnic, and explore in peace. We go for the nature. 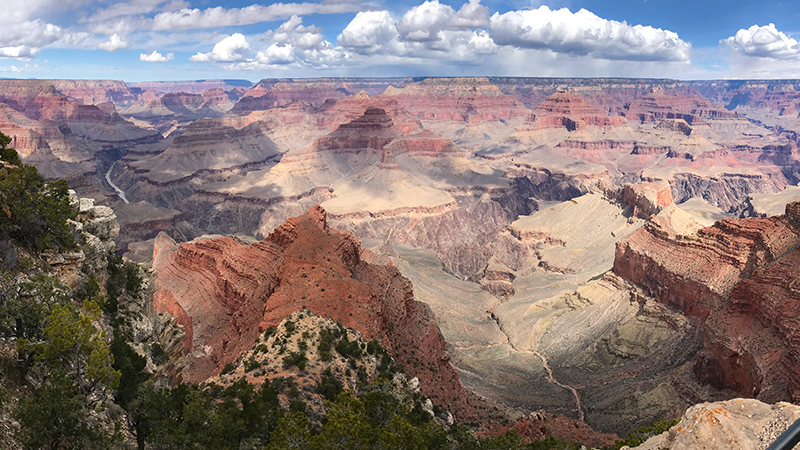 So I dug in, did more research, and made a plan to not only hit all of the best things to do at the Grand Canyon for families, but avoid the crowds. Grand Canyon Village (Center): This is the hub of activity in the national park and the most crowded area. Here you’ll find historic hotels and buildings, scenic overlooks, the Visitor Center and Bookstore, museums, gift shops, restaurants, the Grand Canyon Railroad Depot, the General Store, and the Bright Angel Trailhead. Desert View Drive (East): This 25 mile road stretches from the village to the park’s east entrance. Along the road you’ll find six improved scenic overlooks, four picnic areas, several roadside pullouts, the infamous Desert View Watchtower, and the Tusayan Ruin and Museum. Hermit Road and the Canyon Rim Trail (West): The 7.0 mile Hermit Road and 7.8 mile Canyon Rim Trail mostly parallel each other from the village to historic Hermit’s Rest. Along the route, you’ll find nine scenic viewpoints — some of the best along the entire South Rim. Along the South Rim in Grand Canyon National Park, the average elevation is 7,000 feet, so we decided to do Desert View Drive on our first day in the park and Hermit Road on our second day in the park. We finished all of Desert View Drive by lunch time, so after a delicious picnic, we spent the afternoon exploring the historic Grand Canyon Village. Then the next day, we hiked most of the Canyon Rim Trail from viewpoint to viewpoint, only hopping on the free park shuttle that travels along Hermit Road a couple times. The entire experience took us about five hours. 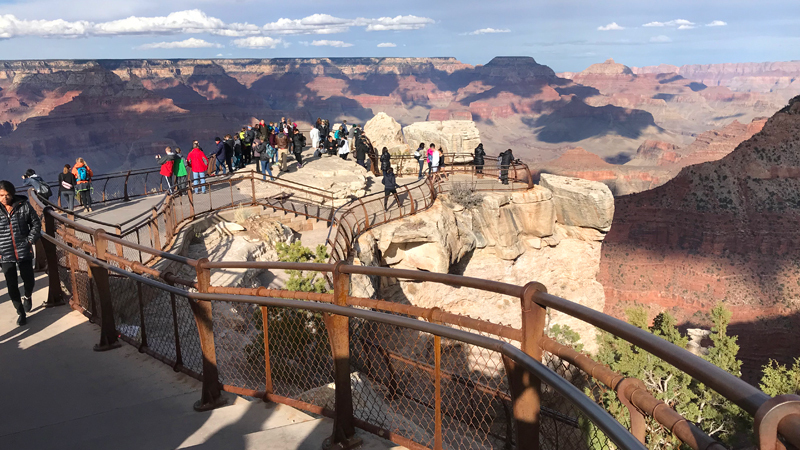 While we spent two days exploring the South Rim of Grand Canyon National Park at a relaxed pace, you could do the entire thing in one day if you rode the shuttle to each viewpoint along Hermit Road. 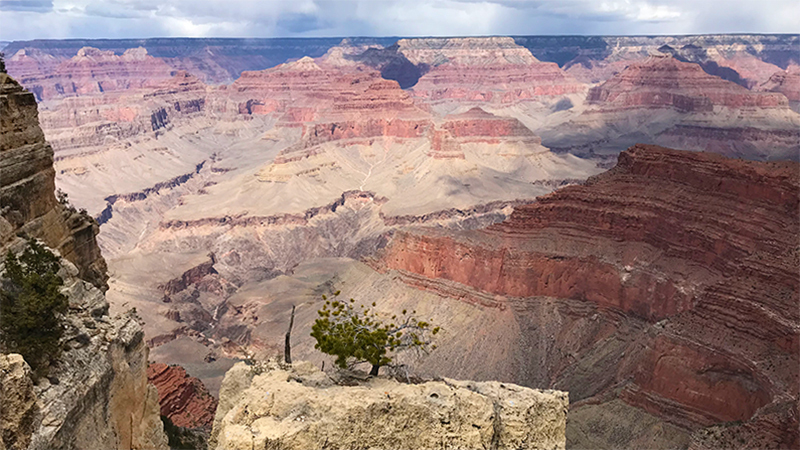 Here is a list of the best things to do and the best viewpoints to see on Grand Canyon’s South Rim in Grand Canyon Village, along Desert View Drive, and along Hermit Road and the Canyon Rim Trail — What’s even better is that they’re pretty much all free! Located directly behind the main South Rim Visitor Center, Mather Point is an easily accessible Grand Canyon overlook with scenic vistas stretching ten miles across the canyon to the North Rim and reaching one mile down to the powerful Colorado River. Because it is so close to the Visitor Center, Mather Point is one of the most popular and most crowded scenic viewpoints in Grand Canyon National Park. 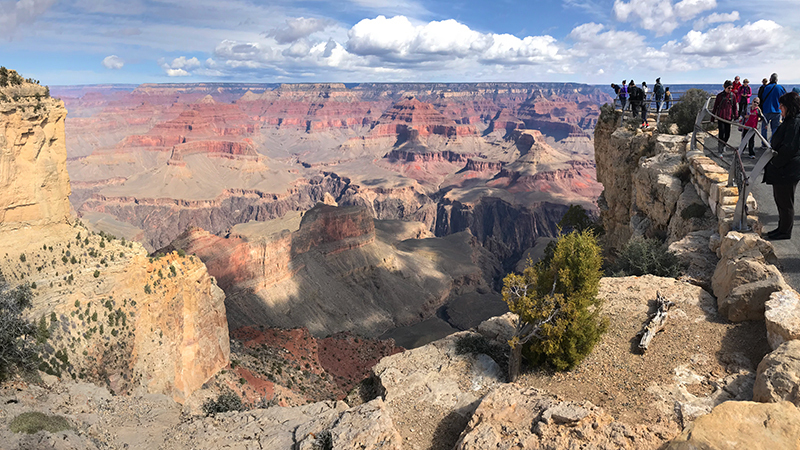 It is often the first stop along the South Rim for families like ours, who can’t wait to see the spectacular, colorful Grand Canyon and visible layers of Kaibab Limestone, Coconino Sandstone, and Vishnu Schist. Surrounded by Pinyon and Juniper woodlands, Yavapai Lodge is the largest lodging complex, with the most affordable prices, in Grand Canyon National Park. It is also the closest lodge to the popular Mather Point and the Grand Canyon Visitor Center. The lodge offers guests a grab-and-go coffee shop, a souvenir and gift shop, a cafeteria-style restaurant, and a tavern with a full bar, local beers, and wine. Verkamp’s Visitor Center and Museum is Grand Canyon National Park’s newest Visitor Center in one of its oldest buildings. For more than a century, it was a curio shop and family home and today it is a park museum and gift shop. Verkamp’s has museum-quality exhibits about the history of Grand Canyon Village and the Grand Canyon Community — documenting what it was like to live and work on the edge of one of the seven natural wonders of the world. A walking history timeline on the floor leads visitors through the exhibits on a tour of the important moments in local, national and international history. Bright Angel Trail begins in Grand Canyon Village on the south rim of the Grand Canyon at 6,850 feet elevation. It descends 4,380 feet with an average grade of 10%. At the trail’s end, the River Trail continues another 1.9 miles to the Bright Angel Campground and Phantom Ranch, totaling 10 miles. 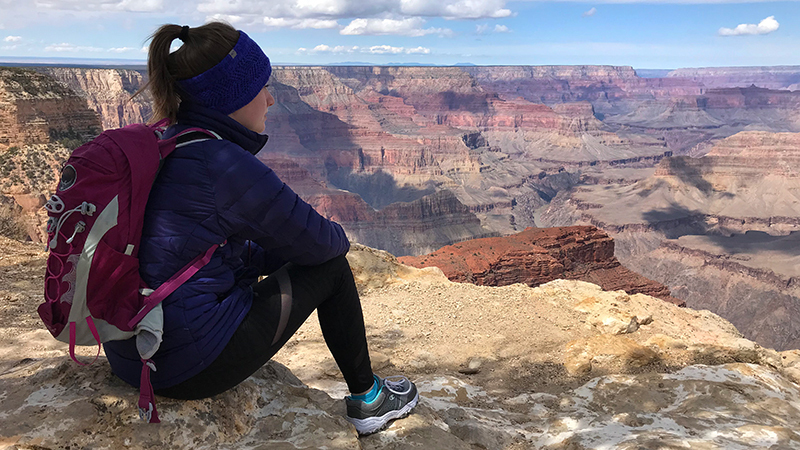 Even if you’re a casual hiker, you’re visiting with family or inexperienced hikers, or you’re visiting Grand Canyon for only a short period of time, you need to put Bright Angel Trail on your list of things to do because you can just hike a small portion of it to see breathtaking views and an amazing rock tunnel. The Yavapai Point Overlook provides what many consider to be the best panoramic views of this part of the Grand Canyon South Rim. It is the northernmost overlook and the closest to the Colorado River, you you’ll enjoy unobstructed, magnificent views of canyon ridges and the river below. The Yavapai Museum of Geology, also called the Yavapai Observation Station, sits one mile east of Grand Canyon Village’s Market Plaza on the edge of Grand Canyon’s South Rim and features breathtaking views of Grand Canyon, geologic displays, interpretive exhibits, and a bookstore with gifts and souvenirs. Grand Canyon Railway provides a beautiful, historic 65 mile, 2 hour 15 minute train ride from Williams, Arizona to the South Rim of Grand Canyon National Park with the help of authentic western characters and musicians who bring the Old West to life. Pipe Creek Vista sits on the Rim Trail, which stretches along the Grand Canyon South Rim from Hermit’s Rest to the South Kaibab Trailhead. Yaki Point was closed for construction during our Grand Canyon visit, so we had to skip it. This photo is from the National Geographic Grand Canyon Visitor Center website. At an elevation of 7,262 feet, Yaki Point is one of the most popular overlooks to watch the sunrise and sunset on the South Rim. The scenic overlook is accessed by a 1.5 mile spur road off Desert View Drive and it is the only viewpoint on Desert View Drive only accessible by walking or riding the free Kaibab Rim Route (Orange) Shuttle Bus. The west-facing views from Yaki Point include the Bright Angel Trail, part of the Tonto Trail and the South Kaibab Trail as it travels down Cedar Ridge and O’Neill Butte. The east-facing views include Cremation Creek, Newton Butte, and Clear Creek. Early mapmakers saw castles and temples in the rocks of Grand Canyon and named the features as such, likewise, some rock formations received more playful names. At this Desert View Drive roadside pullout, the vertical rock formation is known as “Duck on a Rock.” Decade after decade, visitors come to this spot to look for the duck and imagine what other rock formations resemble. While the duck in the “Duck on a Rock” formation is the smallest topmost rock segment, if you look at the entire vertical, bulging formation, our family thought it looks more like a big fat bear with a small head sitting down with it’s four legs pointing to the left. Due to erosion, nothing in Grand Canyon stays the same, and one day, this formation will likely take a different shape. At Moran Point, three main rock groups are clearly visible, including the Layered Paleozoic Rocks that make up most of the Grand Canyon’s depth; the Grand Canyon Supergroup, and the Vishnu Basement Rocks, which are the oldest at Grand Canyon. Located 3 miles west of Desert View Watchtower near the south rim of the Grand Canyon, the settlement featured a central plaza surrounded by storage rooms that held food for the winter, ceremonial structures, and living quarters. A mostly flat 0.1 mile gravel trail circles around the ruin and the small, square, two room Tusayan Museum has exhibits that bring the ruins to life and tell the story of the prehistoric people. Along with the six improved scenic overlooks on Desert View Drive, there are five unnamed, unmarked pullouts along the road that also offer amazing views of the colorful Grand Canyon and often, there are far fewer people at the pullouts than the official viewpoints. We travel with a huge ice chest in the back of the truck and food for all three meals each day, so we opted to picnic at the roadside pullouts over the scenic overlooks because we could park right along the edge of the road and enjoy the views, instead of parking farther away in a parking lot. We skipped the picnic areas because they were on the opposite side of the road, without a view. Sitting at an elevation of 7,360 feet, Lipan Point offers an almost 360 degree panoramic view of Grand Canyon, including Hance Rapid, the Grand Canyon Supergroup, Unkar Delta, and the San Francisco Peaks. Falling the full height of a three story building, Hance Rapid is one of the most hazardous whitewater rapids on the Colorado River. The rocks of the Supergroup date from 740 million to 1,200 million years old. The Unkar Delta is a 1,000 year old ancestral Puebloan farming village. Sitting on Grand Canyon’s South Rim, Navajo Point is the highest elevation scenic overlook. The only vista point that is higher is standing on the very top observation deck of the Desert View Watchtower. It offers a spectacular view of the Watchtower standing tall on the cliffs and breathtaking panoramic vistas to the west and north up the Colorado River. Sitting at an elevation of 7,438 feet, Desert View Watchtower is a seven story, 70 foot tall stone tower on the South Rim of the Grand Canyon within Grand Canyon National Park. Designed by architect Mary Colter and built in 1932, it reflects the architecture of the ancestral Puebloans in the Four Corners region and is the centerpiece of the Desert View Watchtower Historic District. The Desert View Historic District includes the historic Watchtower and store, the Desert View Trading Post gift shop, the General Store and Deli, a gas station, restrooms, and a seasonal campground. 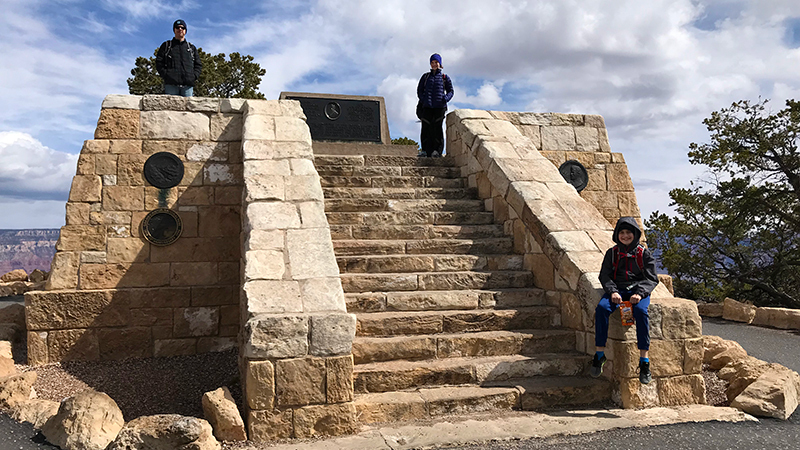 With multiple sets of stairs leading to two large observation platforms and majestic scenic viewpoints, Trailview Overlook in Grand Canyon National Park offers breathtaking views of Grand Canyon Village, the Bright Angel Trail, and the canyon below. From the overlook, you can see the Bright Angel Trail switchbacking down the canyon and tiny specs that are the hikers making their way up or down the trail. You can also see the Grand Canyon Village Historic District and the El Tovar Hotel sitting on the edge of the Grand Canyon south rim. At Maricopa Point, the edge of the canyon sticks out about 100 feet to form a narrow promontory that offers breathtaking, 180 degree, panoramic views of Grand Canyon and the remains of the Orphan Lode Mine. From this viewpoint, you can see the majestic Battleship formation, a portion of the Tonto Trail snaking around Horn Creek and Dana Butte, and parts of the Bright Angel Trail at Garden Creek. Hopi Point is THE point along Hermit Road. It sticks out farther north into the canyon than any other scenic viewpoint on the Grand Canyon and offers the most amazing views on the South Rim. 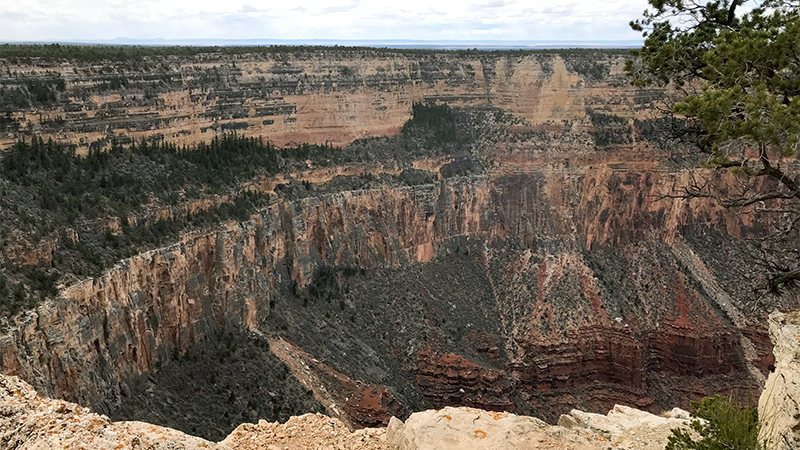 From Hopi Point, you can see Dana Butte, 2,000 feet below the overlook, the Shiva Temple and Zoroaster Temple formations, as well as Isis Temple, Horus Temple, and Osiris Temple on the North Rim. Because the Colorado River bends northwards, this is also the first scenic viewpoint where the western Grand Canyon comes into full view and you can see all the way to Havasupai Point and the Great Scenic Divide. Pima Point is a south rim scenic viewpoint in Grand Canyon National Park that overlooks 40 miles of rugged canyon lands from Bright Angel Canyon to the east to Powell Plateau and the Great Scenic Divide to the west. The scenic overlook is one of the best places to see and sometimes hear the Colorado River. The splash and grind of Granite Rapids below can be heard echoing up the canyon walls on quiet days. The Grand Canyon Village General Store is not just a grocery store. It is also a giant souvenir shop, camping gear and hiking supply shop, and coffee counter/deli. The morning coffee lines at the General Store were much shorter than those at our hotel and the coffee was cheaper. We also stopped at the deli counter in the evening to pick up custom pizzas for my son! 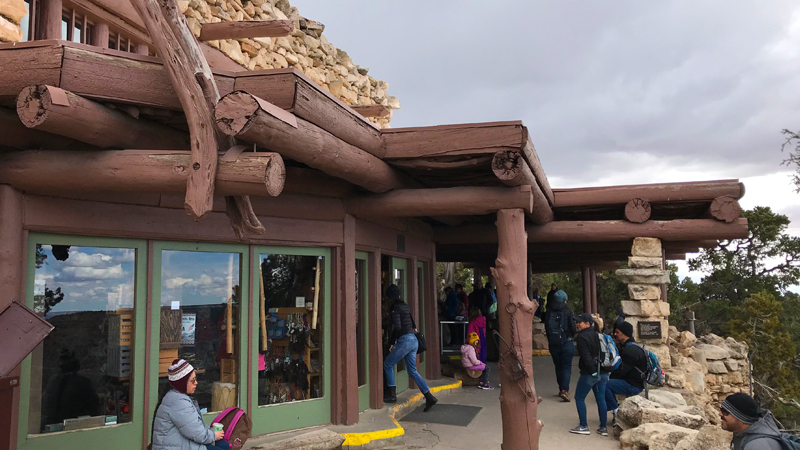 Located outside the South Rim entrance of Grand Canyon National Park in Tusayan, the National Geographic Visitor Center provides park news and park passes, maps and brochures, and information about Grand Canyon attractions, hotels, trails, and Grand Canyon tours. You can’t visit a national park without snapping a commemorative photo at the entrance sign! The Grand Canyon National Park sign at the South Rim is outside the park entrance and it must be a really popular photo spot, because unlike many other parks, this sign has its own parking area and paved walkways. We bring along this lightweight folding tripod that fits in my backpack so we can get photos without whole family in them. Click the link below for directions to the park. Considering a trip to Grand Canyon National Park? Check out these quick tips to make your trip one you’ll never forget! The South Rim of the park is open 24 hours a day, 365 days a year. The South Rim includes Grand Canyon Village and Desert View. In most places, there is no cell phone service or reception, and even when hotels claim to have wifi, it’s usually in the lobby or common areas only and it’s not very good. Put your phone on airplane mode during the day so even though you’ll be using it all day to snap photos, your battery won’t die. Need WiFi to get some work done while on vacation? Head 10 minutes into Tusayan to the National Geographic Visitor Center. Their WiFi is great! We ended up making this a stop each night while at Grand Canyon so we could check email, share photos via social media, and connect with family. There are three pet friendly hotels: Grand Canyon Plaza Hotel, Red Feather Lodge, and Yavapai Lodge. Pets are allowed above the rim at Mather Campground, Trailer Village, and the developed areas. Pets are not allowed below the rim. A kennel is available at Grand Canyon National Park Lodges. There is fast track entry lane for vehicles with pre-paid passes to skip the long lines at the South Rim Entrance Gate. Purchase your 7-day Grand Canyon National Park passes ($30/vehicle) at the Flagstaff Visitor Center in Flagstaff, the Williams Visitor Center in Williams, the Chevron Travel Stop in Valle, and at several locations in Tusayan, including the Best Western Grand Canyon Squire Inn, Grand Canyon Trading Post, R.P.’s Stage Stop, Red Feather Lodge, Canyon Plaza Resort, and the National Geographic Visitor Center (IMAX). A free shuttle bus system operates on the South Rim. The Village (Blue) Route connects the Visitor Center with lodges, the campground, and other facilities. The Kaibab Rim (Orange) Route is the fastest way to get from the Visitor Center to canyon views, the Hermit Road (Red) Route stops at nine incredible scenic viewpoints along a historic road, and the Tusayan Route connects the park with the community of Tusayan. All of the park’s buses are wheelchair accessible, but the park does offer a Scenic Drive Accessibility Permit, which allows entry for visitors with mobility issues to some areas closed to public traffic. The permit is available at entrance gates and National Park Service visitor centers. Eight buildings at Grand Canyon National Park designed by Mary Jane Colter are on the US National Register of Historic Places and included as part of a US National Historic Landmark District. They include Hopi House, Lookout Studio, Hermit’s Rest, Phantom Ranch, the Desert View Watchtower, Bright Angel Lodge, and two employee dorms. Restaurants in Grand Canyon Village are packed, the lines are long, the food is overpriced, and the waits aren’t fun. Consider packing in your own road trip food, drinks, and snacks instead and having picnic meals at scenic vista points with spectacular views. The climate is dry and you’ll dehydrate much faster than you may expect, so bring your own Hydro Flask or water bottle and take advantage of the water bottle filling stations at Hermit’s Rest, Bright Angel Trailhead, Verkamp’s Visitor Center, Yavapai Point, Grand Canyon Visitor Center, and the South Kaibab Trailhead. Bring backpacks or adventure packs for your whole family. We love the Osprey women’s packs and men’s packs and bring them on all our our trips. They’re lightweight, comfortable, and they hold our 40 oz Hydro Flasks, picnic lunch, snacks, and clothing layers. Pack clothing that can be layered because the weather can change rapidly. Bring sunscreen, a sunhat, and sunglasses, but also pack warm jackets, raincoats, beanies, and gloves.